Are you looking for your family's next vehicle? Look no further than the 2017 Hyundai Santa Fe. With three rows of seats, it can accommodate up to 7 passengers. The upgraded styling for the 2017 models features a hands-free lift-gate option with up to 2.3 cubic meters of rear cargo space as well as 51L of under floor storage. Dynamic Bending Light technology adjusts the headlight angle as you turn the steering wheel to improve viewing at night. It also automatically dims the high beams when it detects oncoming traffic! Autonomous emergency braking for pedestrian detection has been added in 2017. Other safety features include blind spot detection, adaptive cruise control, and parking assistance sensors. The improved aerodynamics allow you to reach up to 12.9 L/100km with the FWD model, and 13 L/100km with the AWD model. The styling improvements are obvious on the interior of the Santa Fe as well. A panoramic sunroof is available, as well as heated first and second-row seating, making the interior as luxurious as any SUV on the market. The driver has every need met with a 7-inch touchscreen audio display with Android Auto connectivity and navigation, multi-view cameras, 12-way power seat and dual-zone temperature controls. 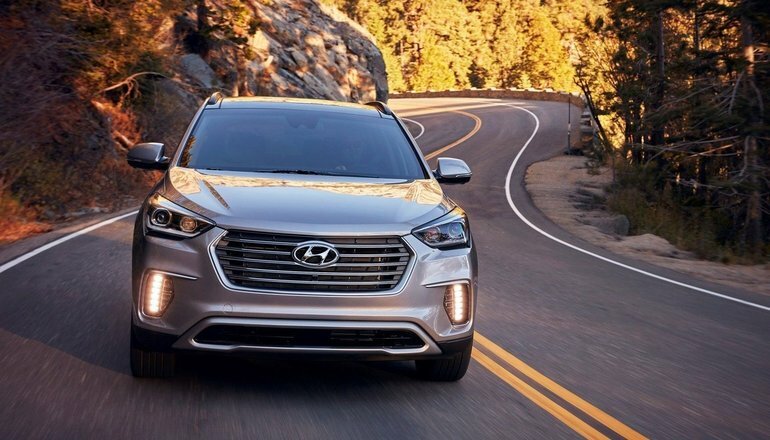 With prices starting at $32,199 the Santa Fe is a front-runner in the full-size SUV/Crossover lineup. If the price or size of the Santa Fe is larger than your needs, the Santa Fe Sport is a great choice. Also available in FWD and AWD models, the Sport option can seat up to 5 passengers, following the same outstanding styling concepts. The only safety feature missing in the Sport option is the Dynamic Bending Light system, but still included is the High Beam Assist feature. Starting at $27,599 you can find the car that fits your family and your needs. Please contact us here at Surgenor Automotive Group with any questions. We want to get you into your new 2017 Hyundai Santa Fe. Follow us on Twitter for more news and updates.